Drummers, in jazz and popular music, have two primary functions. One is to keep an excellent time feel, a foundation for the rest of the band, so they can play with ease over a bed of precise rhythms. The other function has to do with forms. Drummers, just as the other members of the band, need to know the structure of the tune. Drummers are responsible for underlining the form. Western popular-music, in general, is composed of short phrases, which contain a melodic, harmonic or rhythmic cycle. These “short phrases” generally are 4 or 8 measures long. I like to call them the “building blocks” of forms. As a drummer, you need to familiarize yourself with these building blocks. You need to be able to feel and play very comfortably over 4 or 8-bar phrases (building blocks). And that is going to help you deal with more extensive song forms in jazz like the 12-Bars blues, Rhythm Changes, AABA or ABAC forms. I’ll give you an example: a traditional AABA form usually contains four phrases with a length of 8 bars each. Take a look at this. As you can see, the song is formed by one phrase of 8 bars (A) which then repeats, followed by another 8-bars phrase (B) to create contrast. After that, the first phrase (A) reappears to end the song. 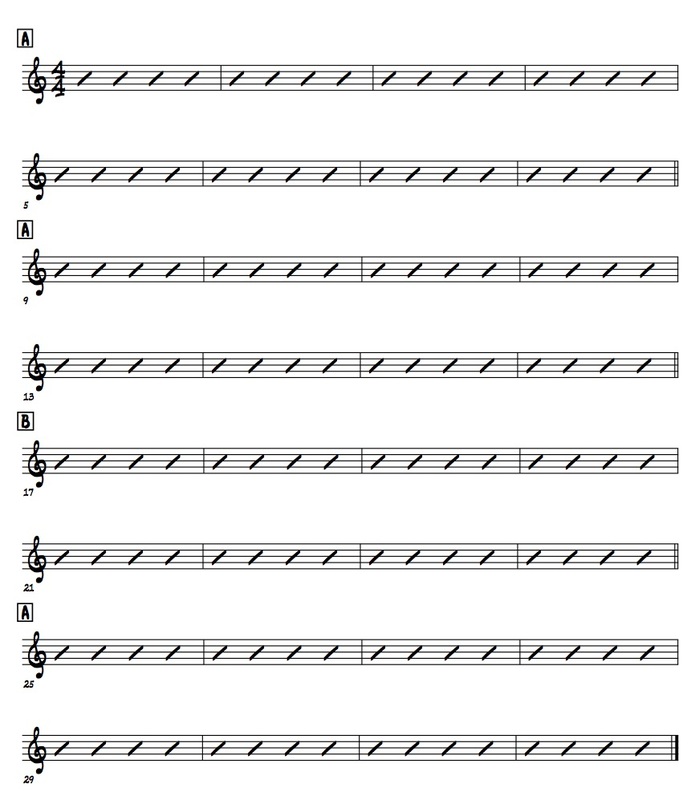 Now, Let’s take a look at the 12 bars blues form. If we break it down, it is formed by three 4-bars phrases. Traditional blues is usually one 4-bar phrase repeated and then a second 4-bars phrase which works as a turn around to go back to the top. So, now that you understand why the building blocks are so important within the structure of a song, we can start practicing and getting comfortable playing and improvising over them. In this lesson, I’m going to share with you some of the exercises I’ve done to improve. These have ultimately allowed me to play whatever I want over these simple forms or building blocks. 1. Everything I play and practice is always in a form. It doesn’t matter what it is, rudiments, stick control, jazz comping, soloing, a lick or fill. Whatever it is, I always practice in form. Of course, first, you need to get past the point of working the mechanics and coordination of what you are learning, but as soon as you are over that, you have to put it into a form. For instance: let’s say you’re learning a 1-bar Elvin Jones’ lick. Once you’re able to play it, you can set a 4-bars form and practice as follows: play three bars in time and then play the lick in the fourth bar. Or you can play three bars of your solo ideas and them play the lick. Then you can trade 4’s with yourself, playing four bars of time, and then four bars of soloing, three bars of your ideas and the lick in the last bar. Just like that, you can come up with hundreds of ideas on how to put any exercise into a form. The challenging part of this concept is to be able to keep the form in your head while practicing. A lot of people use drum machines or programmed sequences to help them keep track of bars. While that might be helpful, I instead use my brain to keep track of the form. Because, when you get to the gig, you’re not going to be able to use your computer or drum machines to count bars for you. So you better train your brain to do it. This is the classic method that every teacher is going to tell you to do. I use it for ordinary exercises and definitely if I’m sight reading. It is worth the effort and a great skill to master if you plan to gig as a session player. However, counting bars could make your playing heavy on the ones, and that is something you don’t want in your playing if you are trying to be a jazz drummer. I prefer to use melodies to keep track of the form. They allow me to phrase more melodically and across the bar line. It is a very basic song which is 8 bars long. So whenever I’m practicing something I sing the melody and I know every time I go through the tune I have completed an 8-bar phrase. So every time I’m practicing, let’s say paradiddles, I sing “Are you sleeping?” and I keep my 8-bars form all the time. You can practice anything, soloing or polyrhythmic exercises while singing a simple melody and you’ll see how challenging it is. But it is a great exercise and a skill you want to have. Because in the end, everything you practice and learn is to be used in a musical context, and singing a melodic line while practicing can help you achieve that. 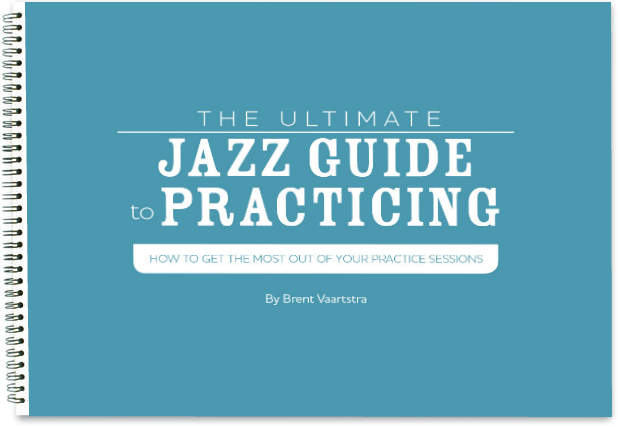 Also, it trains you for the next step, which is learning melodies from jazz standards. Drummers also need to know the melodies of the songs they are playing. It’s not an exclusive job for the melodic instruments; it is the responsibility of everyone in the band to know the songs. You’ll notice the difference when playing tunes you genuinely know. You’ll feel freer and more creative than ever. You’ll never be wondering where the form or the one is. You’ll feel you can go to places and come back with confidence because the melody is always there and present in your mind. Again, you can practice comping ideas, soloing ideas, rudiments, rudimental snare solos, rhythmic readings, always singing the melody of a standard tune. 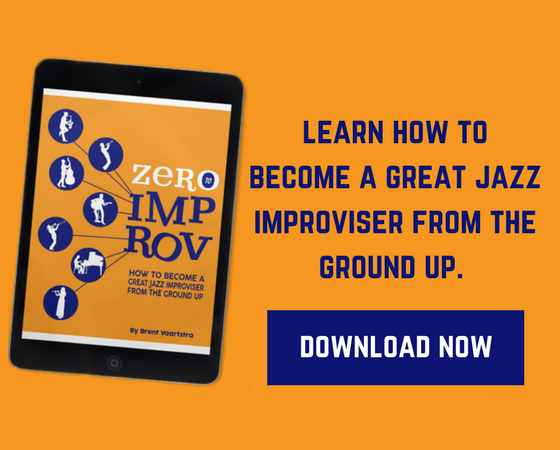 It is challenging, but your jazz drumming skills will improve considerably. Your drumming will make more sense because your ideas are coming from a more melodic point of view and that is going to help you connect with the other musicians in the band. You want to participate in the melodic development of the tune, not only the rhythmic development. Don’t be the best friend of a musician, be a musician first and then a drummer. 2. Listen to tunes you don’t know and try to decipher the form. 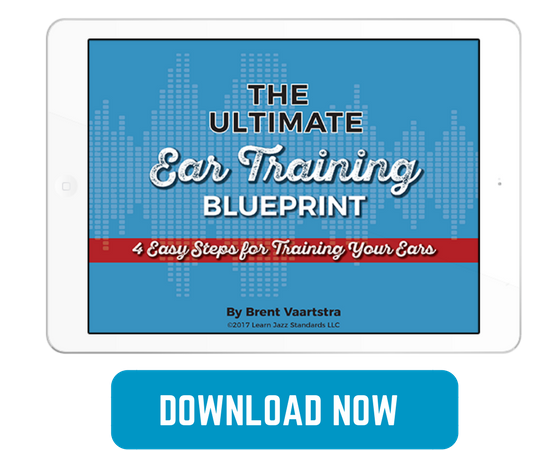 First, you train your ears to make sense of what you are hearing (harmonically and melodically). Second, it is a great help when you sit in on those jam sessions, and someone calls a tune you haven’t heard before. By doing this consistently, you exercise your ability to notice repeating patterns and melodic and harmonic lines. I can also add that if you’re serious about music and drumming, studying harmony and a harmonic instrument like piano will help you a lot to be more musical and keep track of your place within a form while you’re playing. Finally, I have to say that all these exercises are a way to keep you training for the ultimate goal, which is to feel the building blocks (short phrases) and forms. With time, by doing all these exercises regularly you probably won’t need to count or keep a melody in your head. Your phrasing will naturally lead you to play within a form. You will feel the cycle within you. You’ll stop worrying about that so you can use your brain for what is most important: your musical statement. Also, in the lesson “How to Develop Musical and Organized Jazz Drum Solos” I give more ideas on how to work on in your soloing using the standard jazz song forms. So please go and check it out. Hope this lesson was helpful. Feel free to drop a line in the comment section and go to my social media (Instagram or Facebook) and hit me up for comments, questions or if you just want to share some thoughts. Amazing, thank you for the awesome tips on understanding form all while staying musical.